I work in Ann Arbor and at my work a group of coworkers and I go out for lunch to a different restaurant once a month. We do this for one year which allows for twelve unique restaurants to be tested. At the end of the year, each person takes a vote on which restaurant was their favorite, which was the Champion. Sort of a food challenge if you will. However, this year is a little bit different. Instead of picking a theme to follow such as "the breakfast challenge" or "the sub/sandwich challenge", this year is the Tournament of Champions. So instead of twelve restaurants we are going with sixteen. There were just too many Champions to not include certain places. Oh, and there's one rule to any challenge that we do. The restaurant CANNOT be a chain restaurant such as Taco Bell, Subway, or IHop. This allows for us to become familiar with more local places. Being that I just joined in with these challenges last year. There are a TON of places that I haven't tried yet in the Tournament of Champions. So today was this month's lunch challenge day. We went to Angelo's. 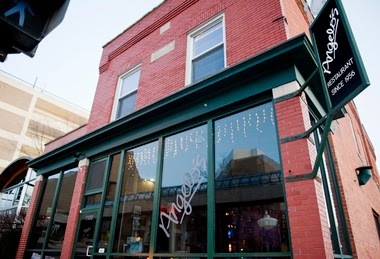 Angelo's is a little family restaurant located in the vicinity of the University of Michigan's central campus. My fellow coworkers had this all planned out so that we would visit this location BEFORE college resumes for the Fall semester. It would nearly be impossible to eat at Angelo's during school months. There is very little parking around to begin with and when schools in...you can kiss your chances of parking even remotely close to the restaurant good-bye! Even today, without school being in yet, it took fifteen minutes to drove there but then it took another fifteen minutes just to find a parking spot. Imagine doing this when there are thousands of students walking around, cars parked in every.single.location, and parking structures only available for students with parking permits. You're pretty much S.O.L. Finally, we made it inside the diner, got our seats, and were greeted by the waiter immediately. After looking over the menu and getting the waiters opinion, I decided to go with their Corn Beef and Hash breakfast. Lucky for me, they serve breakfast all day long! I have never had corn beef and hash before so I thought why not try it at a place where it is raved about. It also came with eggs and your choice of toast. Not even, fifteen minutes later our meals were served. I think all six of us ordered from their breakfast menu...just to give you an idea about how delicious their breakfast selection is! But hang on, I HAVE to tell you about their bread. 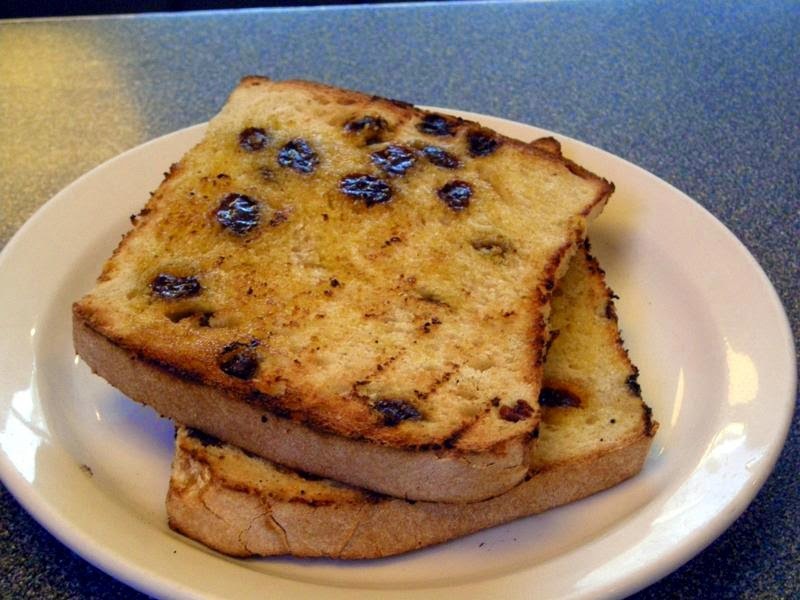 They offer homemade raisin bread! Would you look at that! There's no way that I could pass up that. It was sliced about an inch thick and Angelo's even has a cinnamon sugar shaker on the table to add to your toast. OH.MY.GOODNESS! The combination of everything combined was to die for. As if that wasn't enough, the waiter brought us two of their hot sauces stating that it goes great with the meal I ordered. He was right! The sauce wasn't just hot but it had a great flavor to it. Not to mention that this hot sauce is produced right here, locally in Ann Arbor, as well. 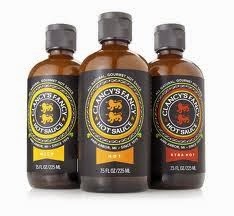 It's called Clancy's Fancy Hot Sauce and comes in multiple levels of spiciness. Will it be the Tournament of Champion's Champion?! This is such a fantastic idea!! It's a great way to get to know the city of Ann Arbor along with trying different types of foods. I can't wait to hear your reviews of the other 15! I have got to go here!! Blogging for the First Time!